Western blot analysis of extracts from various cell lines using AHCYL1/IRBIT (D3A5G) Rabbit mAb. 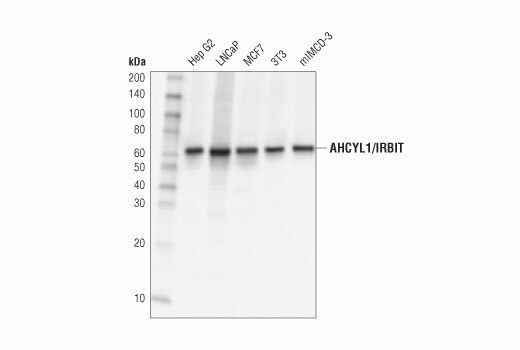 AHCYL1/IRBIT (D3A5G) Rabbit mAb recognizes endogenous levels of total AHCYL1/IRBIT protein. This antibody does not cross-react with AHCYL2/IRBIT2 protein. Monoclonal antibody is produced by immunizing animals with a synthetic peptide corresponding to residues surrounding Glu50 of human AHCYL1/IRBIT protein. S-adenosylhomocysteine hydrolase-like protein 1 (AHCYL1) is a member of S-adenosylhomocysteine hydrolase family, which participates in the metabolism of S-adenosyl-L-homocysteine (1). Two Drosophila homologs of S-adenosylhomocysteine hydrolase-like proteins, dAhcyL1 and dAhcyL2, were identified as novel components of methionine metabolism (2). dAhcyL1 and dAhcyL2 function as dominant-negative regulators of S-adenosylhomocysteine hydrolase (2). Global down-regulation of both dAhcyL1 and dAhcyL2 extended life span (2). In addition, brain-specific down regulation of dAhcyL1 extended life span (2). AHCYL1 is also known as inositol 1,4,5-trisphosphate receptor (IP3R) binding protein released with IP3 (IRBIT) (1, 3). This protein binds to the endoplasmic reticulum calcium release channel IP3R and represses its acitivity (1, 3). As a multifunctional regulator, AHCYL1/IRBIT can also form a complex with and suppress the activity of ribonucleotide reductase, thereby influencing the balance of deoxynucleotide triphosphates essential for DNA replication and genomic integrity (4). Jeong, W. et al. (2012) PLoS One 7, e49204. Parkhitko, A.A. et al. (2016) Genes Dev 30, 1409-22. Kawaai, K. et al. (2015) Proc Natl Acad Sci U S A 112, 5515-20. Arnaoutov, A. and Dasso, M. (2014) Science 345, 1512-5.